Borrowed from systems engineering an integrated product team, or IPT, is composed of people from multiples disciplines working to deliver a single product. While this method was initially implemented in the federal sector, resulting in significant cost savings, it is no longer confined to this space. Top product leaders today recognize that having an integrated, or cross-functional, product team contributes to greater innovation and maximizes results. Different skills and perspectives make a team more flexible and dynamic. However, this is not the only reason why an integrated product team is valuable. In the same way that multiple needs are weighed in the Value Proposition Canvas Template, a product demands contributed effort from development, marketing/sales/customer success, and operations segments. Together, these unique groups create product success. Depending on its type and value prop, a product may lean more heavily on one functional group for its success, requiring that this segment is prioritized over the others in terms of resources, feature concessions, etc.. Friction occurs in an integrated team when this prioritization happens without enough context. Using the IPT template allows product managers to define decisions around features, resources and workload in a way that shows why that decision is correct, though inconvenient for a particular group. This way, the development team can see that the feature that they are asked to spend hundreds of hours creating is pivotal for marketing and marketing why the feature that they would like to be able to use in a campaign, would take too much ongoing operational effort to support. 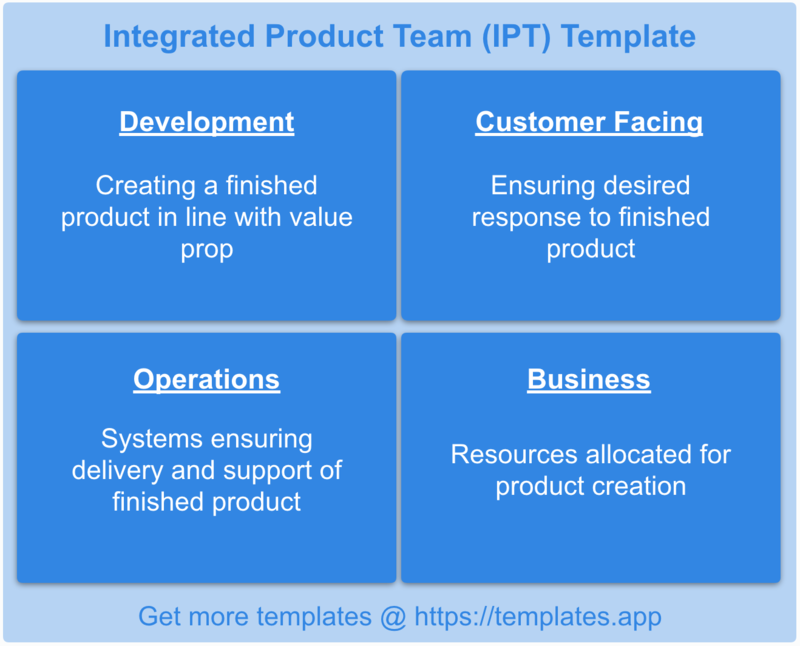 You can launch and use this Integrated Product Team (IPT) Template in Priority Matrix to manage functional groups in your team, foster a productive culture of collaboration and increase visibility into resource/workload decisions and trade-offs.